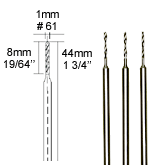 Accessories for rotary tools in dental and industrial quality: Drill Bits. Manufactured from one-piece blanks in tungsten vanadium steel for highest concentricity, providing breakage safety and long lifetime. For drilling metal, non-ferrous metals, plastic and wood. 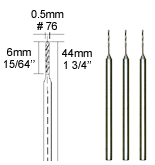 All shanks Ø 2.35mm (3/32"). Work speed see table. 10-piece set. 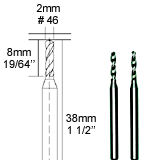 One each Ø 0.3 - 0.5 - 0.8 - 1 - 1.2 - 1.5 - 2 - 2.5 - 3 - 3.2mm (3/256" - 1/32" - 5/128" - 3/64" - 2/32" - 10/128" - 1/10" - 15/128" - 1/8"). For drilling non-ferrous metal steel and stainless steel. In labelled cassette with fold back and stand function. 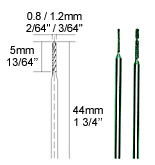 For clamping we recommend our 3-jaw drill chuck. Work speed see table. 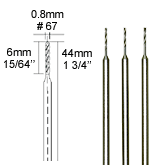 1.5 - 2 - 2.5 - 3 - 3.5 -	4mm (1/64" - 5/64" - 3/32" - 1/8" - 9/64" -- 5/32"). The titanium nitrate coating reduces friction and increases life expectancy. Work speed see table. With ideal cutting angle of 6°. Especially for drilling in glass, porcelain, ceramics, marble (also semi-precious stones) and other hard stones. 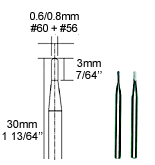 All shanks 3mm Ø (7/64"). Work speed see table. 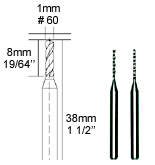 For drilling, cutting and separating fiberglass reinforced	plastic, thermosetting plastic, non-ferrous metals, also for drilling into pearls, corals, etc. 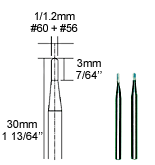 All shanks Ø 2.3mm (3/32"). Work speed see table. 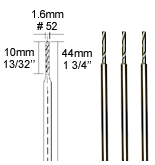 The specified rotational speeds are approximate values for spiral drills made of HSS and tungsten carbide. They must be appropriate for the material of the workpiece. The use of coolant is recommended for aluminium, brass, steel and stainless steel. Plastic can be cooled with compressed air to prevent the drilling chips from fusing. The hardness of derived timber products varies distinctly, therefore only an approximate value can be specified. The harder the wood, the lower the rotational speed!